MBBS from Tirunelveli Medical College, TIrunelveli, Tamilnadu, India (1997) affiliated to The Tamilnadu Dr. MGR medical University, Chennai, India. DM (Endocrinology) from Postgraduate Institute of Medical Education and Research, Chandigarh, India (2004). Life member, Research Society for the Study of Diabetes in India. Life member, Association of Physicians India. Compulsory rotatory internship in major medical and surgical disciplines (January 1996 to December 1997) during MBBS at Tirunelveli Medical College Hospital, Tirunelveli, India. Postgraduate training in Internal Medicine during MD (January 1998 to December 2000) at Postgraduate Institute of Medical Education & Research (PGIMER), Chandigarh, India. Had rotational duties in various specialties including Emergency medicine, Pulmonology, Cardiology, Neurology, Nephrology, Gastroenterology, Endocrinology, Pediatrics, Psychiatry, Dermatology, Hematology, Rheumatology and Intensive Care Unit. Senior Residency (Registrar) in Internal Medicine (January 2001 to June 2001) at Postgraduate Institute of Medical Education & Research, Chandigarh (PGIMER), India. Had rotational duties in emergency department, internal medicine and hematology. Fellowship in Endocrinology (July 2001 to June 2004) at Postgraduate Institute of Medical Education and Research (PGIMER), Chandigarh, India. This 3 year fellowship programme includes rotational duties in 20 bedded endocrinology unit including medical and endocrine patients, twice weekly outpatient department (endocrinology clinic), weekly medical clinic, endocrinology laboratory and endocrinology consultation for various medical and surgical patients admitted to this 1500 bedded hospital. The activities during the fellowship include, Outpatient consultation for various endocrine disorders including Diabetes mellitus, Thyroid disorders, Adrenal diseases, Parathyroid and bone mineral disorders, Reproductive endocrinology and Pituitary disorders. Performing dynamic tests in the evaluation of various endocrine diseases including Growth hormone suppression after glucose load, insulin induced hypoglycemia and combined pituitary stimulation in suspected hypopituitarism, ACTH stimulation test, dexamethasone suppression tests, calculation of tubular reabsorption of phosphate, vitamin D challenge test in normocalcemic hyperparathyroidism, GnRH stimulation test in precocious puberty, hCG stimulation test in hypogonadism and 72-hour prolonged fast for evaluation of hypoglycemia. Education of patients with diabetes mellitus with regard to their disease, foot care, and insulin therapy including acquaintance with various insulin preparations, and technique of insulin administration. Consultation for endocrine disorders in various medical and surgical patients. Emergency interventions including management of diabetic ketoacidosis, hypoglycemia, hyperglycemic hyperosmolar syndrome, acute adrenal crisis, myxedema coma and disorders of electrolyte imbalance. Training in endocrinology laboratory equipped with facilities for estimation of various steroid and peptide hormones. Teaching postgraduate medical students, physiotherapy graduates, and postgraduate Nursing students. Academic activities such as seminars, bedside case discussions, weekly clinico pathological conferences, weekly mortality meeting and weekly interactions with other specialties like Pathology and Radiology. Started working as consultant endocrinologist at Kovai Medical Center and hospital, Coimbatore, Tamilnadu, India. The hospital is a 500 bedded multi specialty hospital. The hospital chairman Dr. N.G.Palaniswamy is an Endocrinologist himself. We run an outpatient clinic where up to 50 patients with various endocrine disorders are attended to daily. A special diabetic clinic is also conducted. I have a special interest in treating patients with thyroid disorders and gonadal diseases. 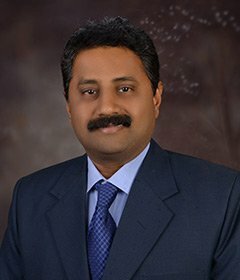 Consultant Endocrinologist at Royal Care Super speciality Hospital, Neelambur, Coimbatore, Tamilnadu, India. Successfully completed ‘Course on Research Methodology and Biostatistics’ held at Postgraduate Institute of Medical Education and Research (2000). IELTS with an overall band score of 8.0. Left ventricular function in subclinical hypothyroidism, before and after treatment with L- thyroxine- thesis submitted to Postgraduate Institute of Medical Education and Research in partial fulfillment for MD (internal medicine) degree. Insulin resistance in acromegaly before and after tumour surgery- dissertation submitted to Postgraduate Institute of Medical Education and Research in partial fulfillment for DM (Endocrinology) degree. A Retrospective study of the clinical, hormonal, radiological profiles of patients who underwent surgery for inflammatory lesions of the pituitary and the surgical outcome- during the fellowship in Endocrinology. 38 th Annual Conference of the Endocrine Society of India held at Amrita Institute of Medical sciences, Cochin from 18 th to 20 th December 2008 as Faculty. Sixth APPES (Asia Pacific Pediatric Endocrine Society) scientific meeting held at Xi ’an, China between 17 November and 20 November 2010. 40 th Annual Conference of the Endocrine Society of India held at Christian Medical College, Vellore, Tamil Nadu from 9 th to 11 th December 2010. Hormones 2011, Conference on Endocrinology and Diabetes as Faculty, 18th and 19th June 2011, Heritage, Madurai. iCardia- Initiatives and Interventions for Cardiovascular risk reduction in Diabetes as Faculty, 10th and 11th March 2012, Chennai. APICON 2013, 68th Annual Conference of the Association of Physicians of India as Faculty, 31st Jan to 3rd Feb 2013, CODDISSIA complex, Coimbatore. 11th CMC vellore Scientific Symposium on Endocrine Tumours as Faculty. Chairperson for Symposium on Thyroid Tumours. 4th July 2013. CMC Vellore. TRAC 2014, Annual Conference of the Tamilnadu Chapter of RSSDI, as Faculty, 6th and 7th September 2014, Hotel Le Meredian, Coimbatore. Insulin sensitivity in acromegaly- in A.V Gandhi Award for excellence in Endocrinology, New Delhi, India (October 2004). ‘Management of hyperglycemia in acute myocardial infarction’- Kovai lumen, KMCH. Chairperson- “Endocrine Emergencies”. TAPICON 2006. Jenneys Residency, Coimbatore. 30th April 2006. “Management of Diabetes in Hospital”- CME in Dept of Medicine, Tirunelveli medical College, Tirunelveli. 19th July 2008. ‘Long term consequences of steroid therapy in children’- Indian association of pediatrics, Madurai chapter. 29 th May 2010. Madurai. “ADA/EASD and AACE guidelines 2010 for Diabetes management”- Diabetes Summit 2010, 3rd and 4th July 2010, Thekkadi. ‘Short Stature in clinical Practice’- Indian association of pediatrics. Karur Chapter. 13 th February 2011. Karur. “Short stature- How to diagnose and when to treat?” Hormones 2011- Update in Endocrinology and Diabetes. Madurai. June 18 & 19, 2011. “Workshop on Dyslipidemia”- iCardia Initiatives and Interventions for Cardiovascular risk reduction in Diabetes. 11th March 2012, Chennai. “Post prandial Hyperglycemia- How to manage the defect of Type 2 Diabetes in Indians”- Diabetes Summit 2012, 1st and 2nd September 2012, Mettupalayam, Coimbatore. Judge for Posters in Endocrinology, APICON 2013, 68th Annual Conference of the Association of Physicians of India, 31st Jan to 3rd Feb 2013, CODDISSIA complex, Coimbatore. “Bridging the Gaps in Diabetes Management”, CME in Diabetes, 27th October 2013, Hotel Grand Regent, Coimbatore. “Glycemic Variability and Diabetic complications”- TRAC 2014, 6th September 2014, Hotel Le Meredian, Coimbatore. “Pubertal disorders- Case scenarios”. Diabetes and Endocrine summit.Coimbatore. March 14 & 15, 2015. “Autoimmune Endocrine Disorders”- National Conference on Autoimmune Diseases. 8th April 2018. MES Medical College, Perinthalmanna, Malappuram, Kerala. “Clinical Pearls in Thyroidology”- Indian Medical association Tirupur. 19th June 2018. Radisson,Salem. 7th and 8th July 2018. “Endocrine Emergencies” - TAPICON 2018. 14th Annual Conference of the Association of Physician India, Tamilnadu state chapter. Kodaikanal. 13th to 15th July 2018. “Hypertension in Diabetes- Clinical Considerations”. 1st September 2018. Anaikatti, Coimbatore. “The triad story of Type 2 DM - Glycemic variability, Hypoglycemia and Outcomes”. Basal Insulin summit. Coimbatore.7th September 2018. “Management of Type 2 Diabetes mellitus - what next after metformin”. Webinar - Royal care Hospital. Sponsored by MSD pharma. 14th September 2018.